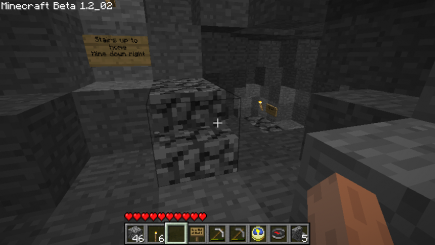 Basically, first you dig a long tunnel that’s the central core of your mine. (That’s not shown in the picture.) Then, you dig another long tunnel going off of it at right angles. (Two high, that’s the hole in the picture on the bottom slightly to the right. Go back to your original tunnel, move three to the left and dig up two squares, and dig another tunnel. (That’s the hole in the upper left.) 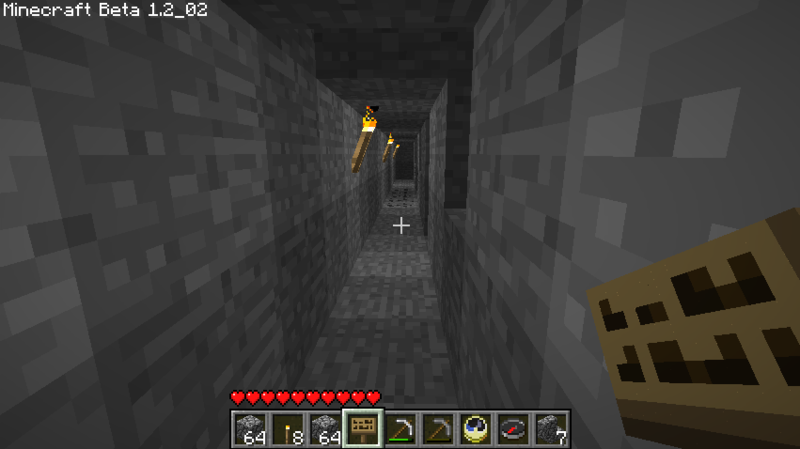 Go back to the original tunnel, move three more to the left and back down to the original level, dig another tunnel. Repeat until you’re bored. 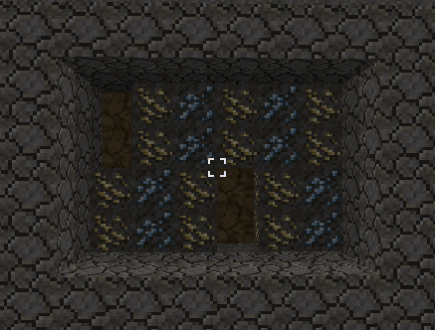 You’ll dig out the holes in the picture directly, and you’ll see most of the yellow squares in that picture (all of them if you tile the region completely, continuing to go up); also, if there is ore in the blue squares, then hopefully it’s part of a cluster that will stick out into one of the yellow squares. 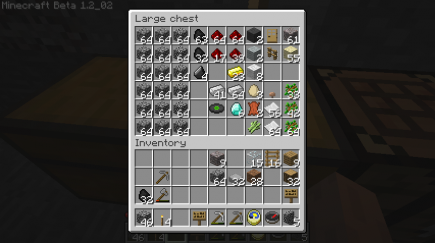 That might not be the case, so you might miss a bit of ore, but you’ll get quite a lot of ore for your effort, more so than if you compulsively made sure you could see every single ore block. So, with that in mind, I needed to start digging! But where? I wanted to be close to home, but also far down; fortunately, my ravine nicely satisfied both of those criteria. I could get there quickly, I already had steep steps down in place, so all I had to do was go down there and find a low point that I could quickly access from the entrance, and that’s where I’d start digging down to my new mine. Going down to the ravine entrance and making a couple of turns gave me an obvious location to start digging my new stairs down. But, as soon as I did that, I found another cave system: this whole area is riddled with caves! Fortunately, the sides of the cave were fairly steep, so they actually worked very well as stairs down, saving me the time it would take to carve them out myself. 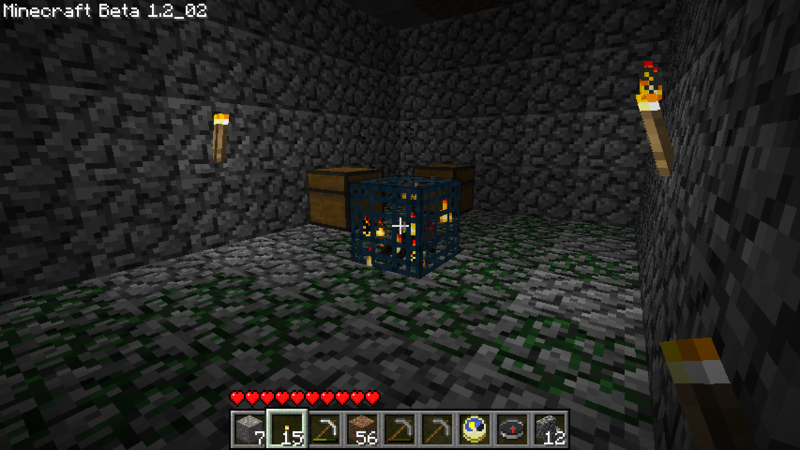 Before going too far down, I explored the new set of caves, where I found my second monster spawner, this time complete with a music disc in one of the chests. 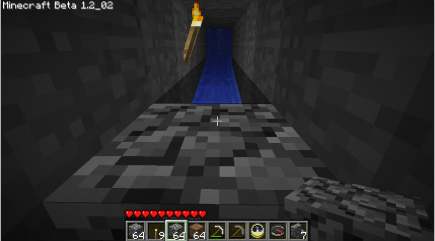 After exploring half of the new caves, I wanted to head back to the main stairs out of the ravine, so I could find a good location for continuing to dig down. And I got completely lost while doing so: I got to familiar areas of the ravine, but I kept on going in circles, missing the key turn back up. After a few minutes, I finally found the main stairs, but clearly I needed to add some signs; so I decided to go back up to my house and build some. 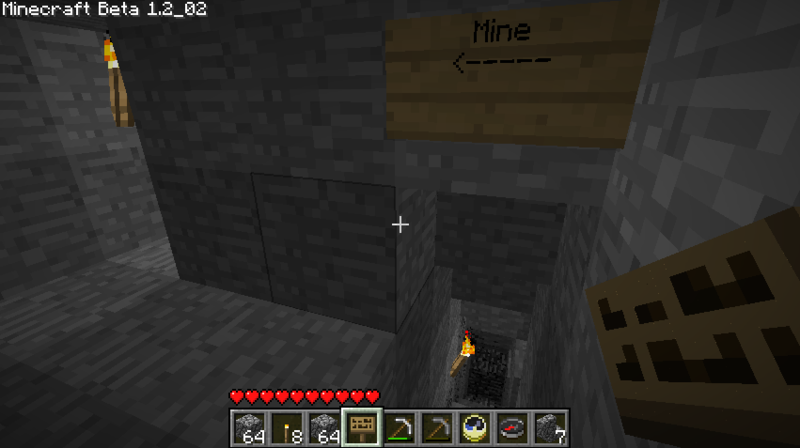 Armed with the signs, I descended down into the ravine, and put the signs at various turns, giving directions both to home and to where I wanted to put my new mine. I also put in stairs in a few locations, to give another clue as to the main route. I didn’t actually have to do much digging during this point: the cavern system did a good job of going down at an appropriate slope for quick traversal of vertical distances. 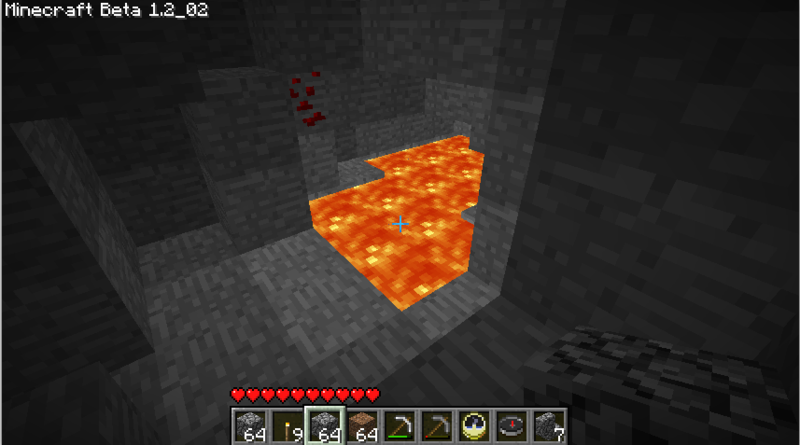 Eventually, I hit a lava pool; based on my reading, this probably meant that I was at level 10, and at a good level for mining. That's one of my old lava galleries! 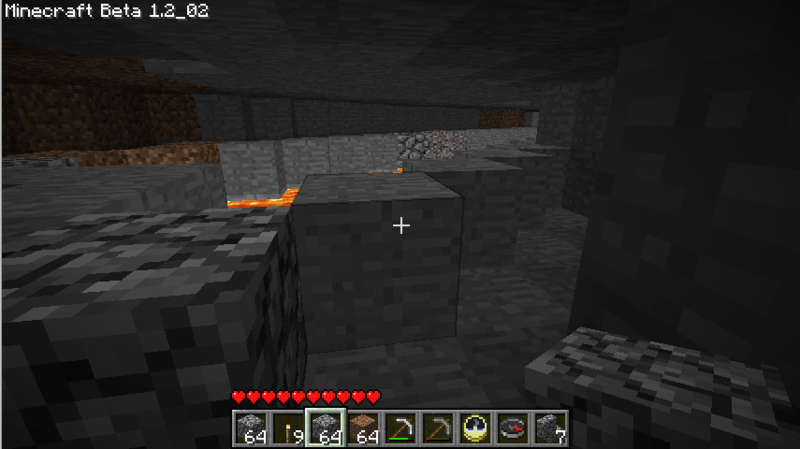 It was one of the galleries around the lava that I’d dug out the last time I was down here! I had no idea that I was so close to that region; that also served to confirm that I was on the lava level (it was at the same height as the other pool), and it also suggested that I should build my mine in a different direction, because I knew there was more lava where that came from. 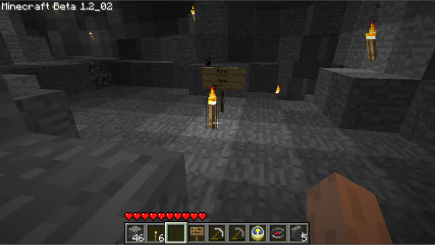 So I went over to a wall away from that lava, and started digging. 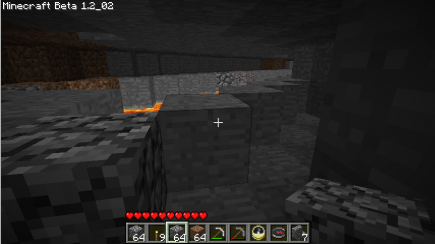 First, I dug down to bedrock, just to confirm that I was at about the height I thought I was, then went back up until I was just above the lava level and started digging the central corridor of my mine. After which, I started branch corridors off to the side at various appropriate distances and heights. 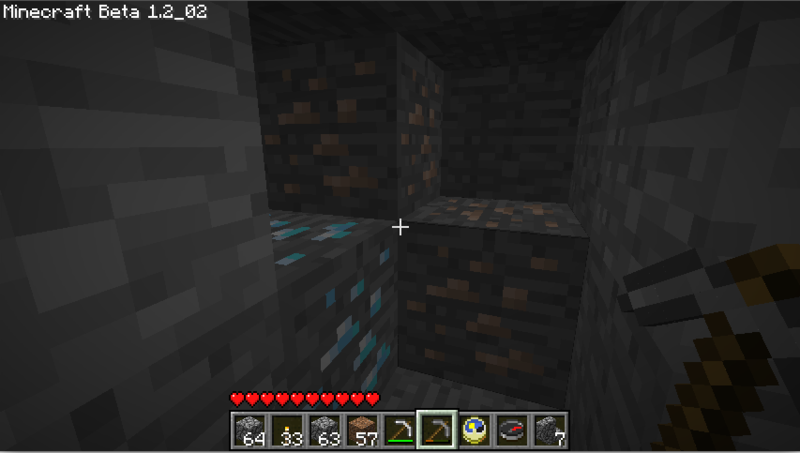 Which was very successful: here’s a picture of the only diamond lode I found, but I found several iron supplies (not as much as I’d like, but better than I’d been doing before), a couple of bits of gold, and more redstone than I know what to do with. I also found something that I didn’t want, namely water: one of my corridors flooded as I dug into it. I need a better plan for dealing with that (anybody have good suggestions? 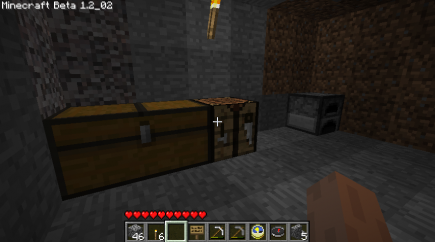 ), but in the meantime I decided that I should build a workroom at my mine entrance. That way, I could leave my valuables in a chest there, so if I got incinerated by lava, I would’t loose too much stuff. 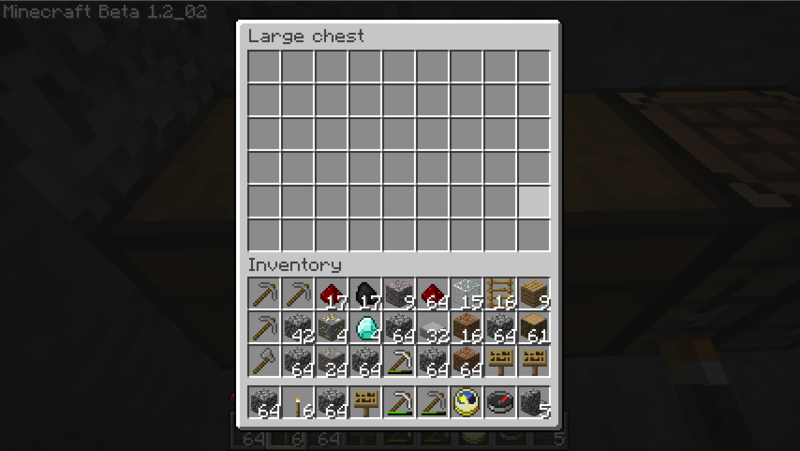 Here’s all the loot I have collected so far. 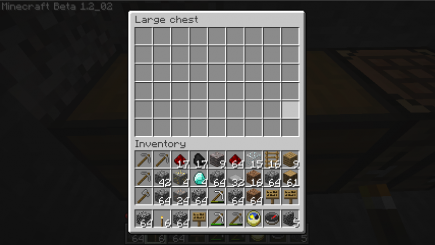 (Or at least most of it: I should look through other chests to make sure I don’t have anything valuable in them.) 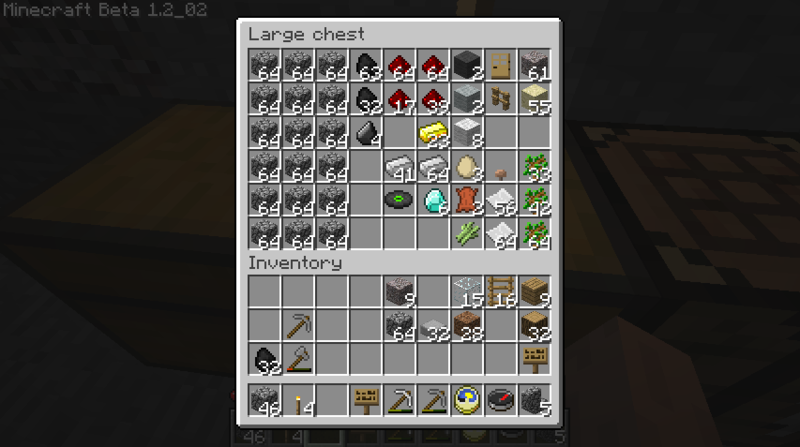 184 pieces of redstone that are crying out for me to come up with a plan to use them; 105 iron ingots, which should be enough to make 272 segments of minecart tracks. (Is that a lot? I should count off that distance above ground: my hope is that it will make it comfortably over the desert to the south, but I’m not convinced that it will go much beyond that. Though, looking at those pictures, I think I won’t quite need 100 tracks to cross that desert, so maybe it actually is a good start.) I should build a jukebox, too, to use that record! But I’ll probably stick with mining for a little while: it’s strangely soothing, and I actually really like traveling through the ravine to get there.